A couple months ago, I received a friendly postcard in the mail from my local traffic safety association. Turns out it had been a whopping three years since I made it through the ridiculously nitpicky Japanese driving test, and that meant it was time to renew my license. You can see a picture of what one of those postcards looks like here. As I looked online to find out more about what this process would entail, I discovered that the Internet has a pretty good collection of stories on this subject already. My favorites come from TokyoWriter and Yuttaring. And last year Dan quietly added a detailed guide to help you through your own renewal here on AccessJ. Now, seeing as it took me four visits to the 運転免許センター (unten menkyo center) in southern Nagano to initially obtain my license, and that every other time I've tried to perform some procedure related to my driving experience (like changing the address on my license or updating anything on that frickin' shakensho), it has taken--as TokyoWriter duly notes in his own article--approximately seventeen thousand man-hours and visits to twelve different locations across town, I was ready for anything when it came to this renewal. 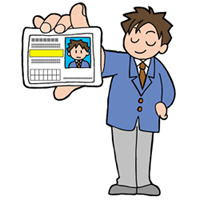 After all, the Internet's opinion is pretty clear: This process is long, tedious, boring, and inconvenient: a bastion of Japanese bureaucracy, complete with the usual (driven more by curiosity than discrimination) extra level of scrutiny applied to non-Japanese who walk through the door. Nerves steeled, I planned my trip to the center a month in advance of my license's expiry date. I wanted to be sure I'd have time for a second and third visit when some document of mine was found to be out of order and I was asked to traipse across town to city hall or my local police station to get it fixed. The one redeeming factor seemed to be that the process could be completed on a Sunday. Unlike that horrible Nagano conversion experience, I wasn't going to have to use up nearly a week of vacation days to get it done. Well, and there was a second redemption: Unlike in Nagano, my local licensing center wasn't going to be a three-hour train ride away. In fact, my current center is just around the corner, barely far enough away for the car engine to warm up on the way over. 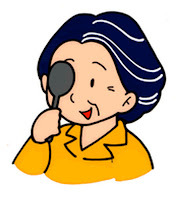 When I walked into the center at 8:55 a.m., bright and early Sunday morning, I first realized the significance of the message on my notifying postcard: 日曜日の更新窓口は、大変混雑します。 "The renewals window is particularly busy on Sundays." "Busy. Yeah." was all that came to mind as I lined up behind a couple hundred other applicants snaked along the inside perimeter of the building. I chalked it up as another bureaucratic experience in Japan and pulled out a book to read as I waited in line. But no sooner had I pulled out the book than the line began to move. Fast. When the windows opened for Sunday business, I suddenly beheld a veteran, well-oiled piece of human machinery. 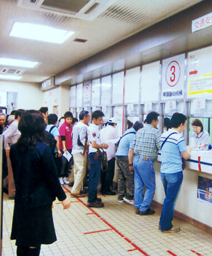 At the tail of the first line, current licenses were collected from every applicant. These were delivered to a photocopier stationed at the head of the line, so that a copy could be produced and affixed to the application form for each individual by the time they arrived at the head of the line. 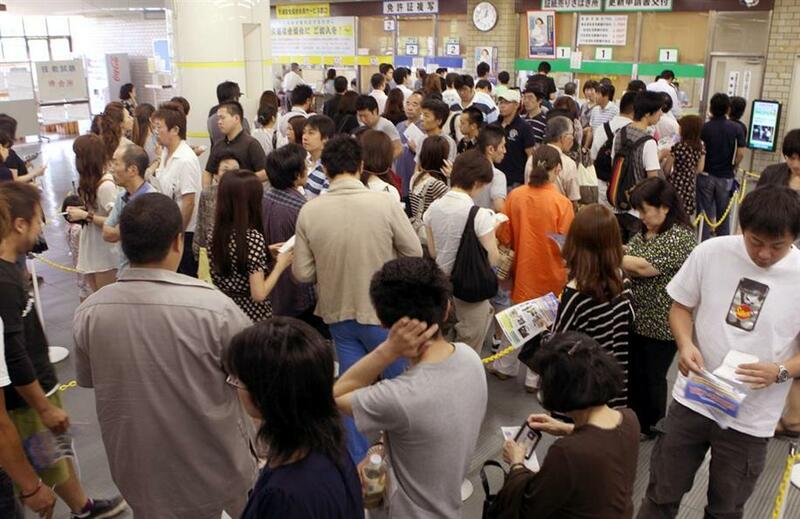 Then the applicants were divided across half a dozen windows, each collecting payment of course and renewal fees. (For me, a first time renewal, the total cost was 4000 yen.) I was also asked here if I wanted to become a donating member of the traffic safety association to help provide bright yellow randoseru covers to first-grade elementary students. I politely declined. Between this and the next line, desks and pens were provided for applicants who hadn't brought their own. If you had your own, you wrote while standing in line: On the application form, you were to note your full name, a current telephone number, and two PIN codes used when encrypting the data on an IC chip embedded in your new license. If any other info needed to be changed (your current address or honseki [where your family records are located, or in the case of foreigners, your nationality]), you marked a check next to that info. I expected to be asked to provide my ARC or my passport in any case; the postcard I'd received explicitly stated that foreign residents may be asked to provide proof of landing permission (在留資格) during the renewal process. But it was never an issue. I was never asked to provide proof of my legal residence in Japan. And since I'd made a point of visiting my local police office to update the address on my license after I moved last year, all of my info was up to date. The officer simply took my application from me and smiled. Finished with that, I got into one final line to have my photo taken. This was again a breeze, and actually the only part of the process that I wish had taken a bit longer. I'd hardly sat down in the seat when the flashbulb went off, leaving me with a nice dazed expression on my ID card for the next three years. But dazed is accurate, because at that moment I felt awestruck. Total time in line? 25 minutes. Nobody badgered me with, "Can you speak Japanese?!" questions. Nobody questioned the ridiculously long name that goes on my license to match my passport. The ordeal I'd been dreading had turned out to be a beautifully orchestrated assembly line. Everything was planned. From my entrance into the front door no minutes nor footsteps had been wasted. I'd just witnessed a spontaneous stabilization of perfection; just a few seconds, mind, before it imploded in on itself. Cynicism whispers that bureaucracy will never shine like this again.